There's something to be said about a simple game that's also incredibly addictive. Sometimes it's tough to put a beat on just what component it is about the game that makes it stand out, to have “it.” But when a game successfully hooks you, it's hard to deny going back for more. 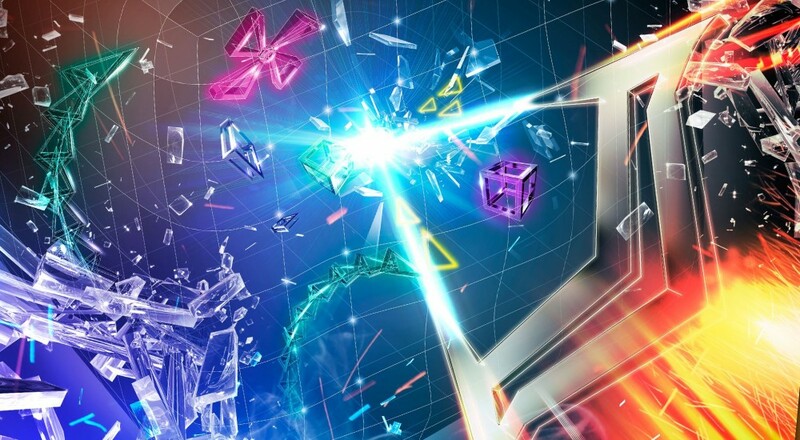 Geometry Wars is a series that's always served that place for me and the third iteration of the series Geometry Wars 3: Dimensions, might be the first time I realize what makes the others so great. 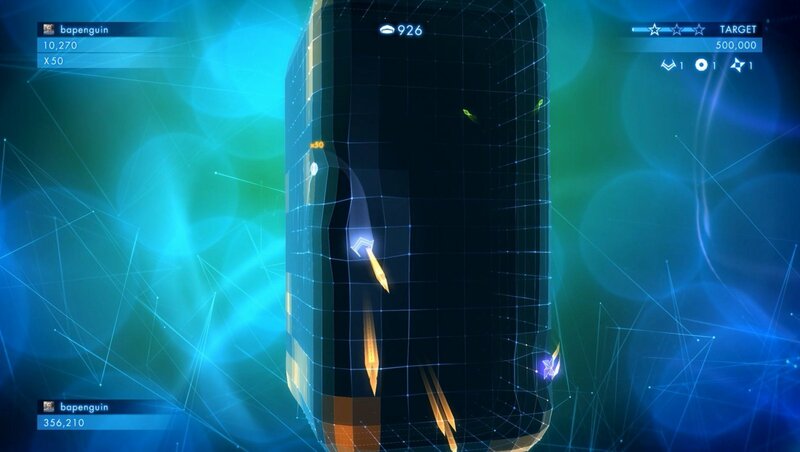 Geometry Wars 3: Dimensions takes the formula created by it's predecessors and adds numerous layers onto it. Developed by Lucid Games, a new studio founded by former Bizarre Creations developers, GW3 is the most feature rich game of the entire series containing a full on “adventure” mode with 50 levels and boss battles, an online versus mode, a local co-op mode, and classic game play modes like Evolved, Pacifism, and Deadline. For $15 you're getting a big bang for your buck, especially if you're a fan of the series who paid full (retail) price for Geometry Wars Galaxies back on the Wii or DS. The game's adventure mode is an interesting take on a progressive system for a twin stick shooter. While there's no story to be had, after all that would be silly, you will be taking on carefully planned out levels. You'll find many of the familiar game play styles here like Evolved, Pacifism, King, and others where your goal is to achieve a score target within a three star ranking. On top of the familiar game modes you'll find some news one too - there's one called Titan that pits players against gigantic versions of the classic shapes that you slowly chip away at until they become the default size. Another has players stopping shapes from painting the all the grid's squares. These missions also take place on irregular shaped boards - not simply a square grid - but instead on three dimensional shapes like spheres, peanut shapes, and cubes. While it's an interesting wrinkle to the formula, I found the shape movement combined with the camera disorienting, even nauseating. Every ten levels you'll hit a boss battle, which players take on typical pattern based bosses. Defeating the boss usually unlocks one of two things. Players gain a little drone that can do secondary things like shoot extra bullets or even collect the multiplier giving geoms that dropped from enemies. You'll also unlock a special ability for the drone like mines or homing missiles. These are limited use specials, much like smart bombs. 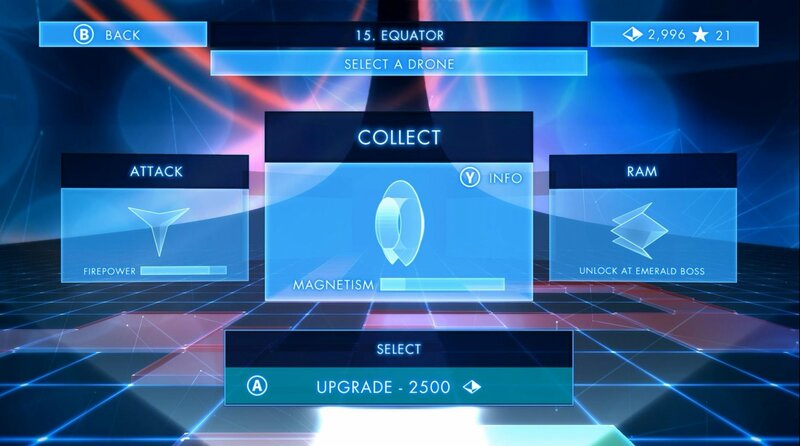 Once unlocked players can upgrade the abilities of each of these by earning points from replaying levels. And in that reveals what I feel is Geometry Wars 3: Dimensions biggest problem - forcing the players into an upgrade and replay type scenario on the levels. Boss battles are gated by star count, which means you'll need earn a specific number of stars to progress to or past a boss. I'd say the requirements are just on the edge of unfair on your first time through, especially for newcomers. What this means is you'll be bouncing back and forth struggling to unlock more stars just to progress. This combined with some of the disorienting nature of the levels left me to spend most of my time with the classic Deadline and Evolved modes. It's not that I didn't like replaying the levels, it's that the feeling of getting a high score is cheapened by using an upgraded drone. Page created in 0.5754 seconds.